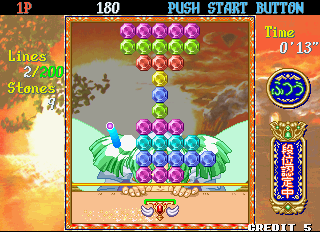 Puchi Carat puts you in control of a paddle, and your job is to bounce a ball to destroy Stones at the top of the screen. Breaking individual stones is fine, but to make the best of it, you want to break the roots - if you break the connecting point of some dangling stones, the ones below will fall off the edge of the screen, awarding more points and turning them into Forward Stones. 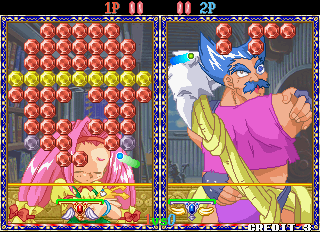 Although the game can be played alone, Puchi Carat is a 2-player competitive game at heart. The game moves fast and furiously, and your objective is to fill your opponent's arena with Forward Stones, blocking their shots and cluttering their screen. Each character you play as has a unique attack pattern, determining where their Forward Stones will be placed and forcing them to adapt. Peridot, for instance, fills nine out of ten columns with stones; with only a few forward stones, this only serves to fill in gaps in the opponent's board, but with a lot arriving at once, it can dominate the screen and give them only one narrow nook to wriggle into. Meanwhile, Paz chucks all his stones into the four columns on the left, making for a concentrated attack but gives the opponent ample room to work elsewhere or chip away at it... if they have enough time! Knowing what to expect and how to react is vital for battling each character. 2) If the ball reduces the on-screen stones to 5 or less, up to 3 new lines will appear. 3) If the ball touches the floor, anywhere from 3 to 5 lines will advance, depending on the difficulty. The ball will just bounce upwards, so don't worry - the ball is never out of play. Prompting stones to advance is a vital part of gameplay, and letting the ball hit the floor isn't something to be avoided, but to be used whenever deemed useful. Not enough stones on-screen to make a good attack? Forward Stones blocking a good base-break? Hit the floor and see if the new lines give you something to work with! It's a balancing act, however; you want a lot of stones to make a good score or strong attack, but having so many makes it hard to manoeuvre your bounces. If the stones advance beyond the Limit Line, you lose. 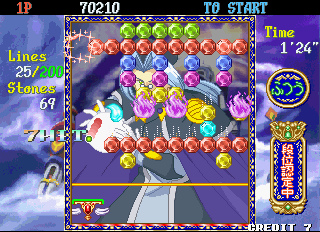 The arcade version requires credits for you to continue, and will return you to the start of the match with the very same stone pattern. The PlayStation and Game Boy versions allow unlimited continues, and will randomise the stone pattern with every attempt. All versions will, after a certain number of continues, offer you a leg-up and give a stone pattern filled with Shining Stones. Stones come in several flavours, most of them with different properties. All stones (except Forward Stones) will appear in single-player modes, whereas it is only in rare stone patterns that they appear in versus modes. Destroyed in 1 strike. Comes in 6 different varieties. A tough stone; requires 2 strikes to destroy. Impossible to destroy via striking; can only be removed by destroying its root. Comes in 6 colours, and if struck, will destroy all Normal Stones of the same colour on-screen. Strike this to destroy every stone on-screen. Does not create Forward Stones, though. 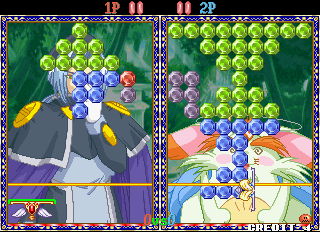 Identical to Normal Stones; these are stones deposited on the opponent's screen, and are uneffected by Shining Stones. "Board" in the Game Boy Color version, "Cursor" in the PlayStation version. "Deadline in the Game Boy Color version, "Finish Line" in the PlayStation version. Also known as "Hindrance Stone" in the PlayStation version. This is a single-player mode where you must break a required number of lines - either 50, 100 or 200 lines. There is no competitive element to this mode, only a test of your own skills (and an attempt to top the scoreboards!). The final line will always have an All Clear Stone to make your job easier. If you erase all blocks on the screen, you are awarded a Perfect score bonus, plus a splash portrait of your chosen character. There are 3 for each character in the arcade and Game Boy versions, and 5 in the PlayStation version; portraits 1 and 2 will repeat once before the third will show. Arguably the main meat of the game, and the source of all kinds of crazy quotes. A single-player mode where you progress through the chosen character's story, defeating each opponent to take their Secret Stone and make your wish come true! This is available in 3 difficulty settings: Beginners, Middle and Difficult. Beginners is a glorified tutorial, however: it prefaces each battle with tips on the game, gives both players a larger paddle, and only offers the first three stages before suggesting you try a harder difficulty. The Game Boy version features different stories from the arcade version, with new prologues, endings and dialogue. It does not have difficulty settings, though. The PlayStation version replaces the Difficult setting with a new Original Story Mode, which features new (dryly translated) dialogue, new endings and slightly different stories. You can choose to fight any opponent in any order you please, and defeating them will unlock their attack pattern; you can choose a pattern before each fight. Each character has three endings (except for Patrako, who only has one), and what outcome you get is determined by how many continues you use, and what order you fight the opponents. See the PlayStation page for the specifics. Completing the game without using a single continue will play a special credits sequence. A 2-player battle mode; challenge a pal into declaring which of you is the superior Puchi Carat player! You can have up to 5 rounds to determine who the victor is, though the default is 3 rounds. Exclusive to the PlayStation and Game Boy versions. A mode identical to Trial Mode (with new music, though! ), only now there's a timer counting up - try to clear the stage as fast as possible, and challenge your previous records! The Game Boy version has 3 difficulty settings, though the PlayStation version has 4, including a hidden one unlocked after completing the first four stages. 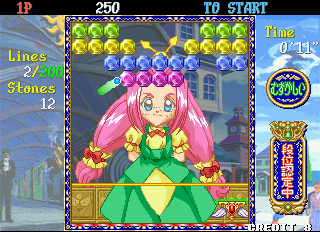 Completing a stage rewards you with artwork of a character garbed in a flag girl's outfit; C-Mond in Easy, Thyst in Normal, Pearl & Dearl in Difficult, Sapphire in Very Difficult, and Patrako in Mania. Another variant of Trial Mode, but with no goal in sight - so long as you remain in play, it'll just keep going! The PlayStation version features chibi versions of the player characters doddling about in the lower-right; they randomly change after every 50 lines.